ABSOLUTELY STUNNING OCEAN VIEW HOME! This two bedroom + den checks all the boxes. OCEAN VIEW,WEST OF THE 5, END UNIT, PRIVATE PATIO,2 CAR ATTACHED GARAGE, and ACCENTED WITH THE HIGHEST OF UPGRADES. Even before entering the home, the pride in ownership is evident. The private walkway leads to a beautiful custom Mahogany front door. Upon entering, note the beautiful tile floors, baseboards and crown moulding that span the spacious downstairs living area. Be impressed by the reclaimed wood wall that accents the family room. The kitchen is complemented with high end custom wood cabinetry, stunning stainless appliances, hood and desirable farm sink! Step outside to the very private patio, perfect for entertaining or that morning cup on coffee. Upstairs hosts both bedrooms and the office. Wake up to ocean views, and go to sleep with stunning sunsets from both bedrooms. Both bathrooms have been beautifully upgraded with granite, high end fixtures and glass sliding shower doors. 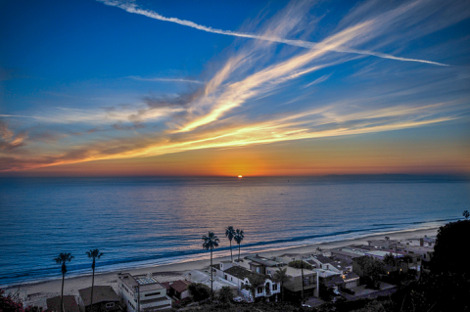 Centrally located between Dana Point Harbor and San Clemente pier. This home is minutes from sandy beaches and great surf! The community has a gorgeous oversized pool, spa, park and playground. Water and basic cable are also included in the HOA fees. So wait no longer, get your feet sandy, and make this beach retreat your own!